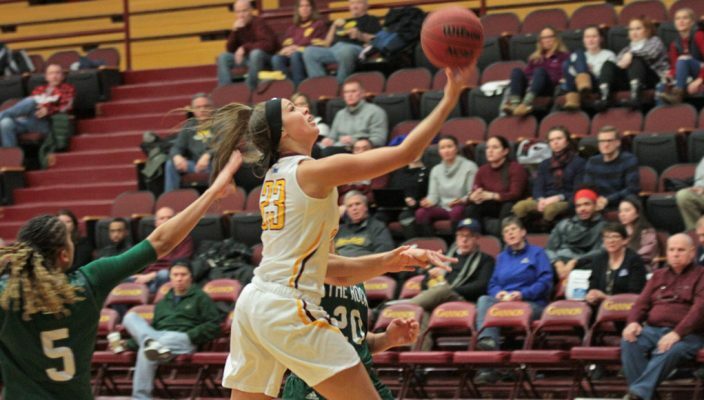 The Gannon University women´s basketball team snapped a two-game losing streak with a win over Slippery Rock and then made it two in a row by beating the University of Pittsburgh at Johnstown last week. The Knights defeated Slippery Rock, 75-69, on Jan. 30 at the Hammermill Center and then went on the road to beat Pitt-Johnstown, 59-40, Saturday. The two wins left Gannon at 11-11 overall and 7-7 in Pennsylvania State Athletic Conference action going into Wednesday’s 5:30 p.m. matchup with Seton Hill at the Hammermill Center. Saturday’s win was powered by a strong defensive effort for Gannon that put Pitt-Johnstown 26 points under its season average. A good second half from the Knights left the Mountain Cats in single figures both quarters. On Wednesday at the Hammermill Center, Gannon and Slippery Rock were tied at 67-67 with just over a minute remaining. An offensive rebound and follow-up basket from Ivana Twumasi put Gannon ahead, and strong offensive rebounding on the next possession led to two Nicole LaCava free throws that extended the Knights’ lead to four points with just 14 seconds remaining in the game. In Saturday´s game, Gannon led 13-10 after one quarter and extended the lead to 19-12 early in the second quarter. LaCava scored six straight points later in the quarter to put the Knights up 27-22 and Gannon finished the half with a 7-1 run and a 30-23 lead. Chelsea Rourke did a lot of the offensive damage, scoring 12 points in the half while LaCava added eight. Pitt-Johnstown cut the lead to six at 34-28 in the third quarter, but Gannon went on an 8-0 run and took a 14-point lead going into the final quarter. Gannon maintained the lead into double digits and a three from Boston McKinney sealed the deal with the Knights up 54-40. Rourke finished the game with 17 points and seven rebounds while LaCava added 11 points and Haley Tewes contributed 10. The Knights held Pitt-Johnstown to just 17 percent shooting from the floor in the second half. In Wednesday´s game, Slippery Rock started with a strong initial quarter that resulted in a 21-12 lead. But Gannon countered with a 14-0 run in the second quarter that lasted less than four minutes and Rourke scored seven straight points. After the Rock finally stopped the barrage with a basket, Gannon ripped off nine more in a row. Gannon outscored Slippery Rock in the second quarter, 24-8, and owned a 36-29 lead at halftime. A 3-pointer by Slippery Rock’s Brooke Hinderliter nine seconds into the half cut Gannon´s lead to four at 36-32. McKinney and Sydney Mitchell nailed back-to-back 3-pointers to kick-start an 11-0 run that put Gannon up by double digits, 49-36, with less than five minutes left in the third. But a 7-0 run put the visitors within six. The Rock kept the pressure on and eventually forged a 67-67 tie. That set the stage for Twumasi’s follow-up basket with 1:02 remaining, and the Knights held on for the win. Rourke’s 20 points led all scorers and Mitchell contributed 17 to go with 10 rebounds and five assists. Gannon was aided by some hot shooting in the second half as the team converted half of its 22 field-goal attempts. Following Wednesday’s game with Seton Hill, the Knights will return to action at 1 p.m. Saturday when Indiana University of Pennsylvania visits the Hammermill Center.